The Phillies Instructs downed the Braves 3-0 at Roberts Field in a Friday afternoon FIL game. It was a good game all around. The Phillies showed good pitching, timely pitching and strong defense in the win. The Phillies used five pitchers in the three-hit, shutout. Victor Santos, Christian Hernandez, Tyler McKay and Waylon Richardson each pitched two innings and Blake Bennett pitched the ninth. Ben Pelletier drove-in the first run with a base hit. Watch HERE. A Logan Simmons base hit moved the runners around in the inning with another base hit. Watch HERE. Later in the game, the Phillies added two more runs on hits by Simon Muzziotti, Jesus Alastre, Matt Vierling and Cole Stobbe. Watch HERE. Defensively, catcher Mitch Edwards made a great stab of a pitch wide of the plate and threw to second where they eventually got a baserunner attempting to advance. Watch HERE. Second baseman Christian Valerio had big top of the seventh inning making a pickup of a hard hit ground ball and turned it into a 4-6-3 double play. Then in the bottom of the inning he lined a single to center. He did it all. Watch HERE. The Phillies Instructs go at it again Saturday morning against the Orioles Instructs at the Carpenter Complex. 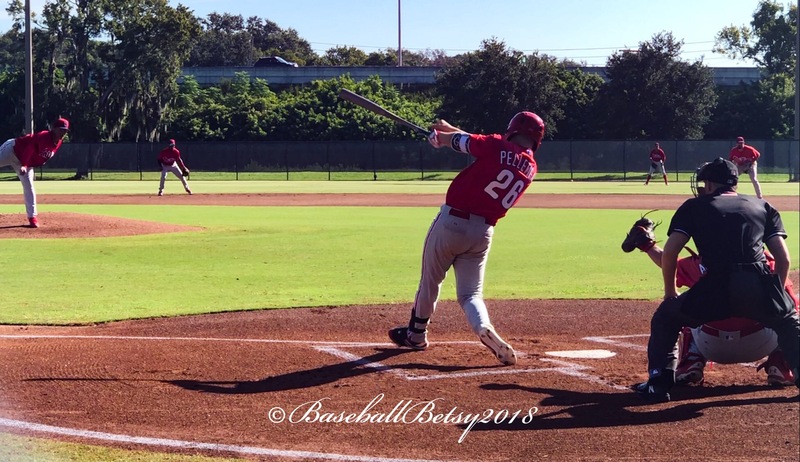 This entry was posted in 2018, September and tagged Baseball Betsy, Ben Pelletier, Blake Bennett, Christian Hernandez, Christian Valerio, Cole Stobbe, Fall Instructional League, Jesus Alastre, Logan Simmons, Matt Vierling, Mitchell Edwards, Philadelphia Phillies, Simon Muzziotti, Tyler McKay, Victor Santos, Waylon Richardson. Bookmark the permalink.